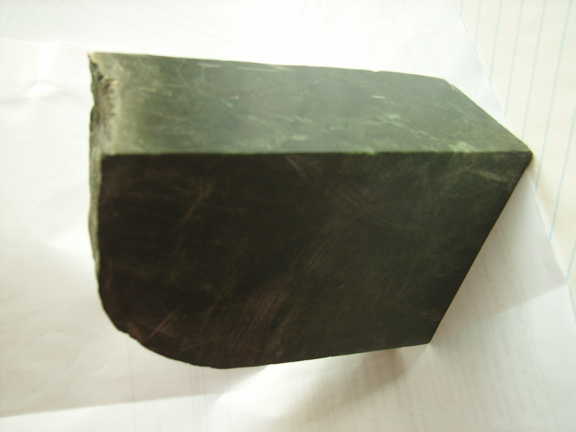 This (A-Type) natural black jade rough has excellent texture and even color. Perfect for cabochons, bangles or carvings. Does not have lab report, weight is 1 kg. Jade is believed to give its owner more energy for the body. It is also believed that it can protect the person who wears it. Jade is also believed to help protect and aid the heart, larynx, liver, spleen, thymus, immune system, and nervous system. Crystallography; Monoclinic, though usually microscopic. Refractive Index; Jadeite 1.64 - 1.667. Hardness; Jadeite 6.5 – 7. Specific Gravity; Jadeite 3.25 - 3.36.